Pregabalin, marketed under the brand name Lyrica among others, is a medication used to treat epilepsy, neuropathic pain, fibromyalgia, restless leg syndrome, and generalized anxiety disorder. Its use in epilepsy is as an add-on therapy for partial seizures. When used before surgery, it improves pain but results in greater sedation and visual disturbances. It is taken by mouth. Common side effects include headache, dizziness, sleepiness, confusion, trouble with memory, poor coordination, dry mouth, problem with vision, and weight gain. Serious side effects may include angioedema, drug misuse, and an increased suicide risk. When pregabalin is taken at high doses over a long period of time, addiction may occur, but if taken at usual doses the risk is low. Use during pregnancy or breastfeeding is of unclear safety. Pregabalin is a gabapentinoid and acts by inhibiting certain calcium channels. Pregabalin was approved for medical use in the United States in 2004. It was developed as a successor to gabapentin. It is available as a generic medication in a number of countries but not the United States as of 2018. In the US the wholesale costs is about US$450 per month as of 2019. While in the United Kingdom a similar dose costs the NHS about £6. In 2016, it was the 83rd most prescribed medication in the United States with more than 9 million prescriptions. In the US, Pregabalin is a Schedule V controlled substance under the Controlled Substances Act of 1970. Pregabalin is useful when added to other treatments, when those other treatments are not controlling partial epilepsy. Its use alone is less effective than some other seizure medications. It is unclear how it compares to gabapentin for this use. The European Federation of Neurological Societies recommends pregabalin as a first line agent for the treatment of pain associated with diabetic neuropathy, post-herpetic neuralgia, and central neuropathic pain. A minority obtain substantial benefit, and a larger number obtain moderate benefit. Other first line agents, including gabapentin and tricyclic antidepressants, are given equal weight as first line agents and, unlike pregabalin, are available as less expensive generics. Evidence does not support it being useful in sciatica or low back pain. Pregabalin is not recommended for certain other types of neuropathic pain such as trigeminal neuralgia and its use in cancer-associated neuropathic pain is controversial. There is no evidence for its use in the prevention of migraines and gabapentin has also been found not to be useful. It has been examined for the prevention of post-surgical chronic pain, but its utility for this purpose is controversial. Pregabalin is generally not regarded as efficacious in the treatment of acute pain. [needs update] In trials examining the utility of pregabalin for the treatment of acute post-surgical pain, no effect on overall pain levels was observed, but people did require less morphine and had fewer opioid-related side effects. Several possible mechanisms for pain improvement have been discussed. The World Federation of Biological Psychiatry recommends pregabalin as one of several first line agents for the treatment of generalized anxiety disorder, but recommends other agents such as SSRIs as first line treatment for obsessive–compulsive disorder and post-traumatic stress disorder. It appears to have anxiolytic effects similar to benzodiazepines with less risk of dependence. The effects of pregabalin appear after 1 week of use and is similar in effectiveness to lorazepam, alprazolam, and venlafaxine, but pregabalin has demonstrated superiority by producing more consistent therapeutic effects for psychosomatic anxiety symptoms. Long-term trials have shown continued effectiveness without the development of tolerance, and, in addition, unlike benzodiazepines, it has a beneficial effect on sleep and sleep architecture, characterized by the enhancement of slow-wave sleep. It produces less severe cognitive and psychomotor impairment compared to those drugs; it also has a low potential for abuse and dependence and may be preferred over the benzodiazepines for these reasons. Evidence finds little benefit and significant risk in those with chronic low back pain. Evidence of benefit in alcohol withdrawal is poor as of 2016. Pregabalin has been shown to produce therapeutic effects that are similar to other controlled substances. In a study with recreational users of sedative and hypnotic drugs, a 450 mg dose of pregabalin resulted in subjective ratings of a “good drug effect” and “high” and “liking” similar to 30 mg of diazepam. In clinical studies, pregabalin showed a side effect profile similar to other central nervous system depressants. Very common (>10% of patients): dizziness, drowsiness. Common (1–10% of patients): blurred vision, diplopia, increased appetite and subsequent weight gain, euphoria, confusion, vivid dreams, changes in libido (increase or decrease), irritability, ataxia, attention changes, feeling high, abnormal coordination, memory impairment, tremors, dysarthria, parasthesia, vertigo, dry mouth and constipation, vomiting and flatulence, erectile dysfunction, fatigue, peripheral edema, feeling the effects of drunkenness, abnormal walking, asthenia, nasopharyngitis, increased creatine kinase level. Rare (<0.1% of patients): neutropenia, first degree heart block, hypotension, hypertension, pancreatitis, dysphagia, oliguria, rhabdomyolysis, suicidal thoughts or behavior. Following abrupt or rapid discontinuation of pregabalin, some people reported symptoms suggestive of physical dependence. The FDA determined that the substance dependence profile of pregabalin, as measured by a patient physical withdrawal checklist, was quantitatively less than benzodiazepines. Even people who have discontinued short term and or long term use of pregabalin have experienced withdrawal symptoms, including insomnia, headache, nausea, anxiety, diarrhea, flu like symptoms, nervousness, major depression, pain, convulsions, hyperhidrosis and dizziness. It is unclear if it is safe for use in pregnancy with some studies showing potential harm. Several renal failure patients developed myoclonus while receiving pregabalin, apparently as a result of gradual accumulation of the drug. Acute overdosage may be manifested by somnolence, tachycardia and hypertonicity. Plasma, serum or blood concentrations of pregabalin may be measured to monitor therapy or to confirm a diagnosis of poisoning in hospitalized patients. No interactions have been demonstrated in vivo. The manufacturer notes some potential pharmacological interactions with opioids, benzodiazepines, barbiturates, ethanol (alcohol), and other drugs that depress the central nervous system. ACE inhibitors may enhance the adverse/toxic effect of pregabalin. Pregabalin may enhance the fluid-retaining effect of anti-diabetic agents (Thiazolidinedione). Pregabalin is not a GABAA or GABAB receptor agonist. It is a gabapentinoid and acts by inhibiting certain calcium channels. Specifically it is a ligand of the auxiliary α2δ subunit site of certain voltage-dependent calcium channels (VDCCs), and thereby acts as an inhibitor of α2δ subunit-containing VDCCs. There are two drug-binding α2δ subunits, α2δ-1 and α2δ-2, and pregabalin shows similar affinity for (and hence lack of selectivity between) these two sites. Pregabalin is selective in its binding to the α2δ VDCC subunit. 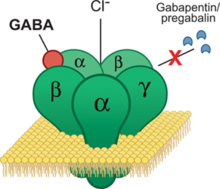 Despite the fact that pregabalin is a GABA analogue, it does not bind to the GABA receptors, does not convert into GABA or another GABA receptor agonist in vivo, and does not directly modulate GABA transport or metabolism. However, pregabalin has been found to produce a dose-dependent increase in the brain expression of L-glutamic acid decarboxylase (GAD), the enzyme responsible for synthesizing GABA, and hence may have some indirect GABAergic effects by increasing GABA levels in the brain. There is currently no evidence that the effects of pregabalin are mediated by any mechanism other than inhibition of α2δ-containing VDCCs. In accordance, inhibition of α2δ-1-containing VDCCs by pregabalin appears to be responsible for its anticonvulsant, analgesic, and anxiolytic effects. The endogenous α-amino acids L-leucine and L-isoleucine, which closely resemble pregabalin and the other gabapentinoids in chemical structure, are apparent ligands of the α2δ VDCC subunit with similar affinity as the gabapentinoids (e.g., IC50 = 71 nM for L-isoleucine), and are present in human cerebrospinal fluid at micromolar concentrations (e.g., 12.9 µM for L-leucine, 4.8 µM for L-isoleucine). It has been theorized that they may be the endogenous ligands of the subunit and that they may competitively antagonize the effects of gabapentinoids. In accordance, while gabapentinoids like pregabalin and gabapentin have nanomolar affinities for the α2δ subunit, their potencies in vivo are in the low micromolar range, and competition for binding by endogenous L-amino acids has been said to likely be responsible for this discrepancy. Pregabalin was found to possess 6-fold higher affinity than gabapentin for α2δ subunit-containing VDCCs in one study. However, another study found that pregabalin and gabapentin had similar affinities for the human recombinant α2δ-1 subunit (Ki = 32 nM and 40 nM, respectively). In any case, pregabalin is 2 to 4 times more potent than gabapentin as an analgesic  and, in animals, appears to be 3 to 10 times more potent than gabapentin as an anticonvulsant. Pregabalin is absorbed from the intestines by an active transport process mediated via the large neutral amino acid transporter 1 (LAT1, SLC7A5), a transporter for amino acids such as L-leucine and L-phenylalanine. Very few (less than 10 drugs) are known to be transported by this transporter. Unlike gabapentin, which is transported solely by the LAT1, pregabalin seems to be transported not only by the LAT1 but also by other carriers. The LAT1 is easily saturable, so the pharmacokinetics of gabapentin are dose-dependent, with diminished bioavailability and delayed peak levels at higher doses. In contrast, this is not the case for pregabalin, which shows linear pharmacokinetics and no saturation of absorption. The oral bioavailability of pregabalin is greater than or equal to 90% across and beyond its entire clinical dose range (75 to 900 mg/day). Food does not significantly influence the oral bioavailability of pregabalin. Pregabalin is rapidly absorbed when administered on an empty stomach, with a Tmax (time to peak levels) of generally less than or equal to 1 hour at doses of 300 mg or less. However, food has been found to substantially delay the absorption of pregabalin and to significantly reduce peak levels without affecting the bioavailability of the drug; Tmax values for pregabalin of 0.6 hours in a fasted state and 3.2 hours in a fed state (5-fold difference), and the Cmax is reduced by 25–31% in a fed versus fasted state. Pregabalin crosses the blood–brain barrier and enters the central nervous system. However, due to its low lipophilicity, pregabalin requires active transport across the blood–brain barrier. The LAT1 is highly expressed at the blood–brain barrier and transports pregabalin across into the brain. Pregabalin has been shown to cross the placenta in rats and is present in the milk of lactating rats. In humans, the volume of distribution of an orally administered dose of pregabalin is approximately 0.56 L/kg. Pregabalin is not significantly bound to plasma proteins (<1%). Pregabalin undergoes little or no metabolism. In experiments using nuclear medicine techniques, it was revealed that approximately 98% of the radioactivity recovered in the urine was unchanged pregabalin. The main metabolite is N-methylpregabalin. Pregabalin is eliminated renally in the urine, mainly in its unchanged form. It has a relatively short elimination half-life, with a reported value of 6.3 hours. Because of its short elimination half-life, pregabalin is administered 2 to 3 times per day to maintain therapeutic levels. The renal clearance of pregabalin is 73 mL/minute. 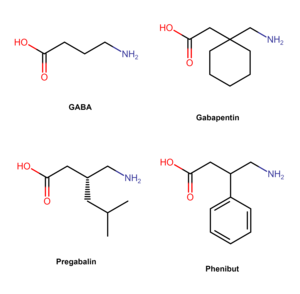 Chemical structures of GABA, pregabalin and two other gabapentinoids, gabapentin and phenibut. Pregabalin is a GABA analogue that is a 3-substituted derivative as well as a γ-amino acid. Specifically, pregabalin is (S)-(+)-3-isobutyl-GABA. Pregabalin also closely resembles the α-amino acids L-leucine and L-isoleucine, and this may be of greater relevance in relation to its pharmacodynamics than its structural similarity to GABA. Chemical syntheses of pregabalin have been described. Pregabalin was synthesized in 1990 as an anticonvulsant. It was invented by medicinal chemist Richard Bruce Silverman at Northwestern University in Evanston, Illinois. Silverman is best known for identifying the drug pregabalin as a possible treatment for epileptic seizures. During 1988 to 1990, Ryszard Andruszkiewicz, a visiting research fellow, synthesized a series of molecules for Silverman. One looked particularly promising. The molecule was effectively shaped for transportation into the brain, where it activated L-glutamic acid decarboxylase, an enzyme. Silverman hoped that the enzyme would increase production of the inhibitory neurotransmitter GABA and block convulsions. Eventually, the set of molecules were sent to Parke-Davis Pharmaceuticals for testing. The drug was approved in the European Union in 2004. The US received FDA approval for use in treating epilepsy, diabetic neuropathic pain, and postherpetic neuralgia in December 2004. Pregabalin then appeared on the US market under the brand name Lyrica in fall of 2005. In 2017, FDA approved pregabalin extended-release Lyrica CR but unlike the immediate release formulation it was not approved for the management of fibromyalgia or as adjunctive therapy for adult patients with partial onset seizures. United States: During clinical trials a small number of users (~4%) reported euphoria after use, which led to its control in the US. The Drug Enforcement Administration (DEA) classified pregabalin as a depressant and placed pregabalin, including its salts, and all products containing pregabalin into Schedule V of the Controlled Substances Act. Norway: Pregabalin is in prescription Schedule B, alongside benzodiazepines. United Kingdom: On January 14, 2016 the Advisory Council on the Misuse of Drugs (ACMD) wrote a letter to Home Office ministers recommending that pregabalin alongside gabapentin should be controlled under the Misuse of Drugs Act 1971. It was announced in October 2018, that Pregabalin would become reclassified as a Class C controlled substance from April 2019. In the United States, the Food and Drug Administration (FDA) has approved pregabalin for adjunctive therapy for adults with partial onset seizures, management of postherpetic neuralgia and neuropathic pain associated with spinal cord injury and diabetic peripheral neuropathy, and the treatment of fibromyalgia. Pregabalin has also been approved in the European Union and Russia (but not in US) for treatment of generalized anxiety disorder. Since 2008, Pfizer has engaged in extensive direct-to-consumer advertising campaigns to promote its branded product Lyrica for fibromyalgia and diabetic nerve pain indications. In January 2016, the company spent a record amount, $24.6 million for a single drug on TV ads, reaching global revenues of $14 billion, more than half in the United States. Up until 2009, Pfizer promoted Lyrica for other uses which had not been approved by medical regulators. For Lyrica and three other drugs, Pfizer was fined a record amount of US$2.3 billion by the Department of Justice, after pleading guilty to advertising and branding “with the intent to defraud or mislead.” Pfizer illegally promoted the drugs, with doctors “invited to consultant meetings, many in resort locations; attendees expenses were paid; they received a fee just for being there”, according to prosecutor Michael Loucks. Professor Richard “Rick” Silverman of Northwestern University developed pregabalin there. The university holds a patent on it, exclusively licensed to Pfizer. That patent, along with others, was challenged by generic manufacturers and was upheld in 2014, giving Pfizer exclusivity for Lyrica in the US until 2018. As of October 2017, pregabalin was marketed under many brand names in other countries: Algerika, Alivax, Alyse, Alzain, Andogablin, Aprion, Averopreg, Axual, Balifibro, Brieka, Clasica, Convugabalin, Dapapalin, Dismedox, Dolgenal, Dolica, Dragonor, Ecubalin, Epica, Epiron, Gaba-P, Gabanext, Gabarol, Gabica, Gablin, Gablovac, Gabrika, Gavin, Gialtyn, Glonervya, Helimon, Hexgabalin, Irenypathic, Kabian, Kemirica, Kineptia, Lecaent, Lingabat, Linprel, Lyric, Lyrica, Lyrineur, Lyrolin, Martesia, Maxgalin, Mystika, Neuragabalin, Neugaba, Neurega, Neurica, Neuristan, Neurolin, Neurovan, Neurum, Newrica, Nuramed, Paden, Pagadin, Pagamax, Painica, Pevesca, PG, Plenica, Pragiola, Prebalin, Prebanal, Prebel, Prebictal, Prebien, Prefaxil, Pregaba, Pregabalin, Pregabalina, Pregabaline, Prégabaline, Pregabalinum, Pregabateg, Pregaben, Pregabid, Pregabin, Pregacent, Pregadel, Pregagamma, Pregalex, Pregalin, Pregamid, Pregan, Preganerve, Pregastar, Pregatrend, Pregavalex, Pregdin Apex, Pregeb, Pregobin, Prejunate, Prelin, Preludyo, Prelyx, Premilin, Preneurolin, Prestat, Pretor, Priga, Provelyn, Regapen, Resenz, Rewisca, Serigabtin, Symra, Vronogabic, Xablin, and Xil. It was also marketed in several countries as a combination drug with mecobalamin under the brand names Agemax-P, Alphamix-PG, Freenerve-P, Gaben, Macraberin-P, Mecoblend-P, Mecozen-PG, Meex-PG, Methylnuron-P, Nervolin, Nervopreg, Neurica-M, Neuroprime-PG, Neutron-OD, Nuroday-P, Nurodon-PG, Nuwin-P, Pecomin-PG, Prebel-M, Predic-GM, Pregacent-M, Pregamet, Preganerv-M, Pregeb-M OD, Pregmic, Prejunate Plus, Preneurolin Plus, Pretek-GM, Rejusite, Renerve-P, Safyvit-PR, and Vitcobin-P, Voltanerv with Methylcobalamin and ALA by Cogentrix Pharma. Pfizer’s main patent for Lyrica, for seizure disorders, in the UK expired in 2013. In November 2018 the Supreme Court of the United Kingdom ruled that Pfizer‘s second patent on the drug, for treatment of pain, was invalid because there was a lack of evidence for the conditions it covered – central and peripheral neuropathic pain. From October 2015 GPs were forced to change patients from generic pregabalin to branded until the second patent ran out in July 2017. This cost the NHS £502 million. ^ a b c d Schifano, Fabrizio (2014). “Misuse and Abuse of Pregabalin and Gabapentin: Cause for Concern?”. CNS Drugs. 28 (6): 491–6. doi:10.1007/s40263-014-0164-4. PMID 24760436. ^ “Pregabalin – Drugs.com”. www.drugs.com. Retrieved 2016-11-07. ^ a b c d e f g h “Summary of product characteristics” (PDF). European Medicines Agency. 6 March 2013. Retrieved 6 May 2013. ^ “Pregabalin (Professional Patient Advice) – Drugs.com”. www.drugs.com. Retrieved 2016-11-07. ^ “Pregabalin (Professional Patient Advice)”. Drugs.com. ^ Hantson, P; Courtois, F; Borrey, D; Haufroid, V (2014). “Pregabalin-associated myoclonic encephalopathy without evidence of drug accumulation in a patient with acute renal failure”. Indian Journal of Nephrology. 24 (1): 48–50. doi:10.4103/0971-4065.125102. PMC 3927193. PMID 24574633. ^ Randinitis, Edward J.; Posvar, Edward L.; Alvey, Christine W.; Sedman, Allen J.; Cook, Jack A.; Bockbrader, Howard N. (2003). “Pharmacokinetics of Pregabalin in Subjects with Various Degrees of Renal Function”. The Journal of Clinical Pharmacology. 43 (3): 277–83. doi:10.1177/0091270003251119. PMID 12638396. ^ Lilley, Linda Lane; Collins, Shelly Rainforth; Snyder, Julie S. (2015). Pharmacology and the Nursing Process. Elsevier Health Sciences. p. 227. ISBN 9780323358286. ^ a b c d e f g “Pregabalin”. The American Society of Health-System Pharmacists. Retrieved 3 February 2019. ^ Frampton, James E. (2014). “Pregabalin: A Review of its Use in Adults with Generalized Anxiety Disorder”. CNS Drugs. 28 (9): 835–54. doi:10.1007/s40263-014-0192-0. PMID 25149863. ^ Iftikhar, IH; Alghothani, L; Trotti, LM (December 2017). “Gabapentin enacarbil, pregabalin and rotigotine are equally effective in restless legs syndrome: a comparative meta-analysis”. European Journal of Neurology. 24 (12): 1446–1456. doi:10.1111/ene.13449. PMID 28888061. ^ Mishriky, B. M.; Waldron, N. H.; Habib, A. S. (January 2015). “Impact of pregabalin on acute and persistent postoperative pain: a systematic review and meta-analysis”. British Journal of Anaesthesia. 114 (1): 10–31. doi:10.1093/bja/aeu293. ISSN 1471-6771. PMID 25209095. ^ a b c d e British National Formulary : BNF 76 (76 ed.). Pharmaceutical Press. 2018. p. 323. ISBN 9780857113382. ^ “Pregabalin Use During Pregnancy”. Drugs.com. Retrieved 4 February 2019. ^ Kaye, Alan David; Vadivelu, Nalini; Urman, Richard D. (2014). Substance Abuse: Inpatient and Outpatient Management for Every Clinician. Springer. p. 324. ISBN 9781493919512. ^ a b “Generic Lyrica Availability”. Drugs.com. Retrieved 4 February 2019. ^ “NADAC as of 2019-01-30”. Centers for Medicare and Medicaid Services. Retrieved 4 February 2019. ^ Pulman, Jennifer; Hemming, Karla; Marson, Anthony G.; Pulman, Jennifer (2014). “Pregabalin add-on for drug-resistant partial epilepsy”. The Cochrane Database of Systematic Reviews (3): CD005612. doi:10.1002/14651858.CD005612.pub3. PMC 4058599. PMID 24623260. ^ a b Zhou, Q.; Zheng, J.; Yu, L.; Jia, X. (17 October 2012). “Pregabalin monotherapy for epilepsy”. The Cochrane Database of Systematic Reviews. 10: CD009429. doi:10.1002/14651858.CD009429.pub2. PMID 23076957. ^ Attal, N.; Cruccu, G.; Baron, R.; et al. (September 2010). “EFNS guidelines on the pharmacological treatment of neuropathic pain: 2010 revision”. European Journal of Neurology. 17 (9): 1113–e88. doi:10.1111/j.1468-1331.2010.02999.x. PMID 20402746. ^ a b Moore, R. Andrew; Straube, Sebastian; Wiffen, Philip J.; Derry, Sheena; McQuay, Henry J.; Moore, Maura (2009). “Pregabalin for acute and chronic pain in adults”. The Cochrane Database of Systematic Reviews (3): CD007076. doi:10.1002/14651858.CD007076.pub2. PMC 4167351. PMID 19588419. ^ Finnerup, N.B. ; Sindrup, S. H.; Jensen, T. S. (September 2010). “The evidence for pharmacological treatment of neuropathic pain”. Pain. 150 (3): 573–81. doi:10.1016/j.pain.2010.06.019. PMID 20705215. ^ Enke, O.; New, H. A.; New, C. H.; Mathieson, S.; McLachlan, A. J.; Latimer, J.; Maher, C. G.; Lin, C. C. (3 July 2018). “Anticonvulsants in the treatment of low back pain and lumbar radicular pain: a systematic review and meta-analysis”. CMAJ : Canadian Medical Association Journal = Journal de l’Association Médicale Canadienne. 190 (26): E786–E793. doi:10.1503/cmaj.171333. PMC 6028270. PMID 29970367. ^ a b Bennett, Michael I.; Laird, Barry; van Litsenburg, Chantal; Nimour, Meryem (2013). “Pregabalin for the Management of Neuropathic Pain in Adults with Cancer: A Systematic Review of the Literature”. Pain Medicine. 14 (11): 1681–8. doi:10.1111/pme.12212. PMID 23915361. ^ Linde, M.; Mulleners, W. M.; Chronicle, E. P.; McCrory, D. C. (24 June 2013). “Gabapentin or pregabalin for the prophylaxis of episodic migraine in adults”. The Cochrane Database of Systematic Reviews. 6 (6): CD010609. doi:10.1002/14651858.CD010609. PMID 23797675. ^ Chaparro, Luis Enrique; Smith, Shane A.; Moore, R. Andrew; Wiffen, Philip J.; Gilron, Ian (2013). “Pharmacotherapy for the prevention of chronic pain after surgery in adults”. The Cochrane Database of Systematic Reviews (7): CD008307. doi:10.1002/14651858.CD008307.pub2. PMID 23881791. ^ Hamilton, T. W.; Strickland, L. H.; Pandit, H. G. (17 August 2016). “A Meta-Analysis on the Use of Gabapentinoids for the Treatment of Acute Postoperative Pain Following Total Knee Arthroplasty”. The Journal of Bone and Joint Surgery, American Volume. 98 (16): 1340–50. doi:10.2106/jbjs.15.01202. PMID 27535436. ^ Patel, Ryan; Dickenson, Anthony H. (2016). “Mechanisms of the gabapentinoids and α2δ-1 calcium channel subunit in neuropathic pain”. Pharmacology Research & Perspectives. 4 (2): e00205. doi:10.1002/prp2.205. PMC 4804325. PMID 27069626. ^ Owen, Richard T. (September 2007). “Pregabalin: its efficacy, safety and tolerability profile in generalized anxiety”. Drugs of Today. 43 (9): 601–10. doi:10.1358/dot.2007.43.9.1133188. PMID 17940637. ^ Bandelow, B.; Sher, L.; Bunevicius, R.; et al. (June 2012). “Guidelines for the pharmacological treatment of anxiety disorders, obsessive-compulsive disorder and posttraumatic stress disorder in primary care”. International Journal of Psychiatry in Clinical Practice. 16 (2): 77–84. doi:10.3109/13651501.2012.667114. PMID 22540422. ^ a b c d Bandelow, Borwin; Wedekind, Dirk; Leon, Teresa (2007). “Pregabalin for the treatment of generalized anxiety disorder: a novel pharmacologic intervention”. Expert Review of Neurotherapeutics. 7 (7): 769–81. doi:10.1586/14737175.7.7.769. PMID 17610384. ^ Owen, R. T. (2007). “Pregabalin: Its efficacy, safety and tolerability profile in generalized anxiety”. Drugs of Today. 43 (9): 601–10. doi:10.1358/dot.2007.43.9.1133188. PMID 17940637. ^ Shanthanna, Harsha; Gilron, Ian; Rajarathinam, Manikandan; AlAmri, Rizq; Kamath, Sriganesh; Thabane, Lehana; Devereaux, Philip J.; Bhandari, Mohit; Tsai, Alexander C. (15 August 2017). “Benefits and safety of gabapentinoids in chronic low back pain: A systematic review and meta-analysis of randomized controlled trials”. PLOS Medicine. 14 (8): e1002369. doi:10.1371/journal.pmed.1002369. PMC 5557428. PMID 28809936. ^ Mannix, Liam (18 December 2018). “This popular drug is linked to addiction and suicide. Why do doctors keep prescribing it?”. The Canberra Times. Retrieved 18 December 2018. ^ Freynhagen, R.; Backonja, M.; Schug, S.; Lyndon, G.; Parsons, B.; Watt, S.; Behar, R. (December 2016). “Pregabalin for the Treatment of Drug and Alcohol Withdrawal Symptoms: A Comprehensive Review”. CNS Drugs. 30 (12): 1191–1200. doi:10.1007/s40263-016-0390-z. PMC 5124051. PMID 27848217. ^ a b c Drug Enforcement Administration, Department of Justice (July 2005). “Schedules of controlled substances: placement of pregabalin into schedule V. Final rule”. Federal Register. 70 (144): 43633–5. PMID 16050051. Retrieved 2012-01-22. ^ “Medication Guide (Pfizer Inc.)” (PDF). U.S. Food and Drug Administration. June 2011. Retrieved 2011-11-06. ^ “Pregabalin Pregnancy and Breastfeeding Warnings”. Retrieved 29 August 2016. ^ Murphy, N. G.; Mosher, L. (2008). “Severe myoclonus from pregabalin (Lyrica) due to chronic renal insufficiency”. Clinical Toxicology. 46 (7): 594. doi:10.1080/15563650802255033. ^ Yoo, Lawrence; Matalon, Daniel; Hoffman, Robert S.; Goldfarb, David S. (2009). “Treatment of pregabalin toxicity by hemodialysis in a patient with kidney failure”. American Journal of Kidney Diseases. 54 (6): 1127–30. doi:10.1053/j.ajkd.2009.04.014. PMID 19493601. ^ Baselt, Randall C. (2008). Disposition of Toxic Drugs and Chemicals in Man (8th ed.). Biomedical Publications. pp. 1296–1297. ISBN 978-0-9626523-7-0. ^ Pregabalin. In: Lexi-Drugs [database on the Internet]. Hudson (OH): Lexi-Comp, Inc.; 2007 [cited 2015 Oct 29]. ^ a b Benzon, Honorio; Rathmell, James P.; Wu, Christopher L.; Turk, Dennis C.; Argoff, Charles E.; Hurley, Robert W. (11 September 2013). Practical Management of Pain. Elsevier Health Sciences. p. 1006. ISBN 978-0-323-17080-2. ^ a b c Bryans, Justin S.; Wustrow, David J. (1999). “3-Substituted GABA analogs with central nervous system activity: A review”. Medicinal Research Reviews. 19 (2): 149–77. doi:10.1002/(SICI)1098-1128(199903)19:2<149::AID-MED3>3.0.CO;2-B. PMID 10189176. ^ Sze, P. Y. (1979). L-Glutamate decarboxylase. Advances in Experimental Medicine and Biology. 123. pp. 59–78. doi:10.1007/978-1-4899-5199-1_4. ISBN 978-1-4899-5201-1. PMID 390996. ^ Arora, Mahesh Kumar; Agarwal, Anil; Baidya, Dalim Kumar; Khanna, Puneet (2011). “Pregabalin in acute and chronic pain”. Journal of Anaesthesiology Clinical Pharmacology. 27 (3): 307–14. doi:10.4103/0970-9185.83672. PMC 3161452. PMID 21897498. ^ McMahon, Stephen B. (2013). Wall and Melzack’s textbook of pain (6th ed.). Philadelphia, PA: Elsevier/Saunders. p. 515. ISBN 9780702040597. ^ a b Lauria-Horner, Bianca A.; Pohl, Robert B. (2003). “Pregabalin: a new anxiolytic”. Expert Opinion on Investigational Drugs. 12 (4): 663–72. doi:10.1517/13543784.12.4.663. PMID 12665421. ^ McElroy, Susan L.; Keck, Paul E.; Post, Robert M., eds. (2008). Antiepileptic Drugs to Treat Psychiatric Disorders. INFRMA-HC. p. 370. ISBN 978-0-8493-8259-8. ^ “LYRICA – pregabalin capsule”. DailyMed. U.S. National Library of Medicine. September 2010. Retrieved 6 May 2013. ^ Wyllie, Elaine; Cascino, Gregory D.; Gidal, Barry E.; Goodkin, Howard P. (17 February 2012). Wyllie’s Treatment of Epilepsy: Principles and Practice. Lippincott Williams & Wilkins. p. 423. ISBN 978-1-4511-5348-4. ^ Wheless, James W.; Willmore, James; Brumback, Roger A. (2009). Advanced Therapy in Epilepsy. PMPH-USA. p. 302. ISBN 978-1-60795-004-2. ^ Vardanyan, Ruben; Hruby, Victor (7 January 2016). Synthesis of Best-Seller Drugs. Elsevier Science. p. 158. ISBN 978-0-12-411524-8. ^ Andrushko, Vasyl; Andrushko, Natalia (16 August 2013). Stereoselective Synthesis of Drugs and Natural Products. John Wiley & Sons. p. 869. ISBN 978-1-118-62833-1. ^ Lowe, Derek. “Getting to Lyrica”. In the Pipeline. Science. Retrieved 21 November 2015. ^ a b Merrill, Nick (25 February 2010). “Silverman’s golden drug makes him NU’s golden ticket”. North by Northwestern. Retrieved 19 May 2016. ^ Andruszkiewicz, Ryszard; Silverman, Richard B. (1990). “4-Amino-3-alkylbutanoic acids as substrates for gamma-aminobutyric acid aminotransferase”. The Journal of Biological Chemistry. 265 (36): 22288–91. PMID 2266125. ^ Poros, Joanna (2005). “Polish scientist is the co-author of a new anti-epileptic drug”. Science and Scholarship in Poland. Archived from the original on August 20, 2016. Retrieved May 19, 2016. ^ Dworkin, Robert H.; Kirkpatrick, Peter (2005). “Pregabalin”. Nature Reviews Drug Discovery. 4 (6): 455–6. doi:10.1038/nrd1756. PMID 15959952. ^ “LYRICA® CR (Pregabalin) Tablets CV | Home Page | Official HCP Site”. www.pfizerpro.com. Retrieved 2018-10-03. ^ Editorial, Reuters. “BRIEF-FDA approves Pfizer’s Lyrica® CR extended-release tablets CV”. U.S. Retrieved 2018-10-03. ^ “Lyrica Price”. Retrieved 3 May 2018. ^ a b Stacey, BR; Liss, J; et al. (2017), “A systematic review of the effectiveness of policies restricting access to pregabalin”, BMC Health Serv Res, 17 (1): 600, doi:10.1186/s12913-017-2503-x, PMID 28841868. ^ “Lyrica – FDA prescribing information, side effects and uses”. ^ Drug Enforcement Administration, Department of Justice (July 2005). “Schedules of controlled substances: placement of pregabalin into schedule V. Final rule”. Federal Register. 70 (144): 43633–43635. PMID 16050051. ^ “Title 21 CFR – PART 1308 – Section 1308.15 Schedule V”. usdoj.gov. ^ Felleskatalogen (7 May 2015). “Lyrica”. felleskatalogen.no. ^ Chalabianloo, F.; Schjøtt, J. (January 2009). “Pregabalin and its potential for abuse”. Journal of the Norwegian Medical Association. 129 (3): 186–187. doi:10.4045/tidsskr.08.0047. PMID 19180163. ^ “Re: Pregabalin and Gabapentin advice” (PDF). GOV.UK. 14 January 2016. ^ Mayor, Susan (2018-10-16). “Pregabalin and gabapentin become controlled drugs to cut deaths from misuse”. British Medical Journal. 363: k4364. doi:10.1136/bmj.k4364. ISSN 0959-8138. PMID 30327316. ^ “Pfizer to pay $2.3 billion to resolve criminal and civil health care liability relating to fraudulent marketing and the payment of kickbacks”. Stop Medicare Fraud, U.S. Departments of Health & Human Services, and of Justice. Archived from the original on August 30, 2012. Retrieved July 4, 2012. ^ “Pfizer’s Lyrica Approved for the Treatment of Generalized Anxiety Disorder (GAD) in Europe” (Press release). Retrieved 2011-11-06. ^ a b “Pfizer Pays $2.3 Billion to Settle Marketing Case”. New York Times. Retrieved 21 December 2017. ^ a b “Pfizer agrees record fraud fine”. BBC News. 2 September 2009. Retrieved 21 December 2017. ^ “Portions of the Pfizer Inc. 2010 Financial Report”. U.S. Securities and Exchange Commission. 2010. Retrieved 21 December 2017. ^ Jacoby, M. (2008). “Financial Windfall from Lyrica”. Chemical & Engineering News. 86 (10): 56–61. doi:10.1021/cen-v086n010.p056. ^ “Patent US6197819 – Gamma amino butyric acid analogs and optical isomers”. ^ “Decision: Pfizer Inc. (PFE) v. Teva Pharmaceuticals USA Inc., 12-1576, U.S. Court of Appeals for the Federal Circuit (Washington)” (PDF). ^ a b “Pregabalin international brands”. Drugs.com. Retrieved 27 October 2017. ^ “Pfizer’s failed pregabalin patent appeal means NHS could reclaim £502m”. Pulse. 14 November 2018. Retrieved 15 November 2018.